For most applications with pipeline sizes greater than 2” (50mm), a simple, rugged Spool Adapter is suggested. This segment of pipe allows the MPR E-Scan sensing head to be installed between two flanges directly in the pipeline. An internal deflector and a 5 degree angled sensing head spud ensures that the sensing head is measuring process from the center of the flow and that coating issues are mimimized as much as possible. The suggested orientation of the sensing head is on a horizontal plane for a horizontal segment of pipe. A vertical segment of pipe is also acceptable if the flow is in the upward direction. 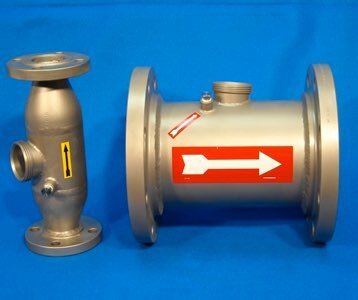 A steam purge tube is standard and requires that the adapter be installed with flow in the proper direction for correct operation. The Prism Purge Pak cleaning system is available and provides pre-mounted and plumbed condensate drain and purge solenoids saving installation time and assuring proper purge action.